Not getting things done? 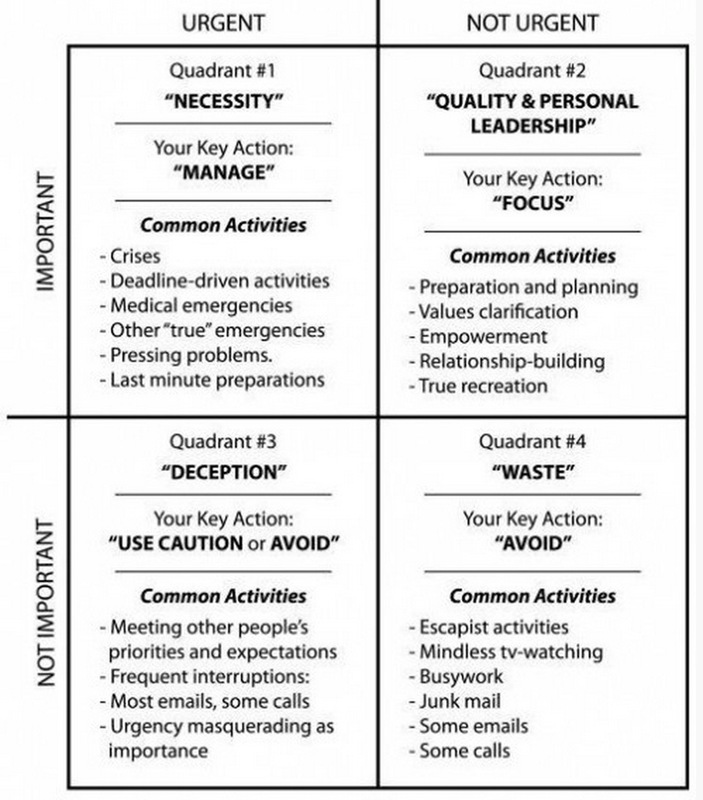 Well, take a look at Covey’s well established model and be honest with yourself…which quadrant are you hanging around in? Is this a blatant clue to the level of your productivity? Are you willing to own up to yourself, really and truly, if your results are not what you know they can be? Being aware that your key actions are mostly to be cautious and avoid and that you are wasting time and deceiving yourself with busy-ness is the first step to making the changes, we know that. So what might be the next step? Making the change to Managing and Focussing? Sure, but actually changing behaviour is not always as easy as we imagine. Sometimes the underlying conditions that are at work keeping us stuck in the unproductive quadrants need a bit of help to be unravelled and surfaced and then the shift in behaviour comes with less effort and is more sustainable. Crossing the bridge and raising our game to operate in quadrants #1 and #2, where our key actions are managing and focussing are the contributors to out success and aliveness. The experience of personal leadership at its best, so worth the journey on so many levels! Covey’s model as an approach to time management goes beyond and beneath just tips and ideas. It is a powerful framework for learning in groups or in one-to-one coaching and can be customised to specific sector nuances and cultural differences.